This posed photo of the Karl King Band is from the 1920s. This photo of the Karl King Band percussion section was taken in the upstairs band hall. It appeared in several trade magazines in the early 1920s. Pictured from left are Walt Engelbart, Chuck Coffee, Karl King, and E.E. Hummy Holmquist. The second floor of Beecher's old harness shop on South 6th Street was used as the Union Hall as well as the rehearsal hall and hangout for the Karl King Band. The standard farewell statement when leaving the band hall was, Last one out kindly close windows! It is visible in this photo, written on the chaulk board at the right. In the photo above, Walt Engelbart is seated at the left end of the table. By this time the third generation of Pray men is performing with Fort Dodge bands. Lou Pray and his son, Carl (Tim) Pray, are seated first and second from left on the far side of the table. The second and third men on the near side of the table are Cy Tremain and C.L. Mattice. Karl King is visible (10th from left with glasses and moustache) just to the right of center on the far side of the table. 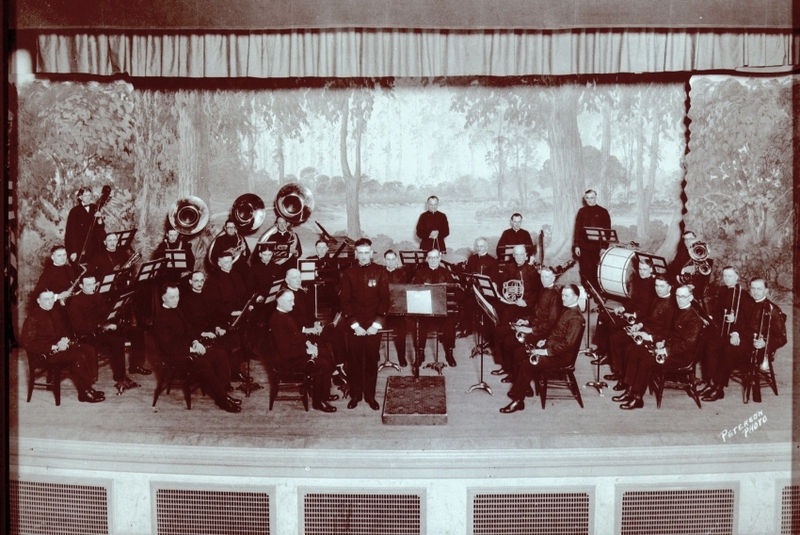 This picture was taken during an intermission of a band concert by the Minneapolis Municipal Park Band at Lake Harriet, under the direction of Michael M. Jalma, one evening when A. Austin Harding and Karl L. King were guest conductors. 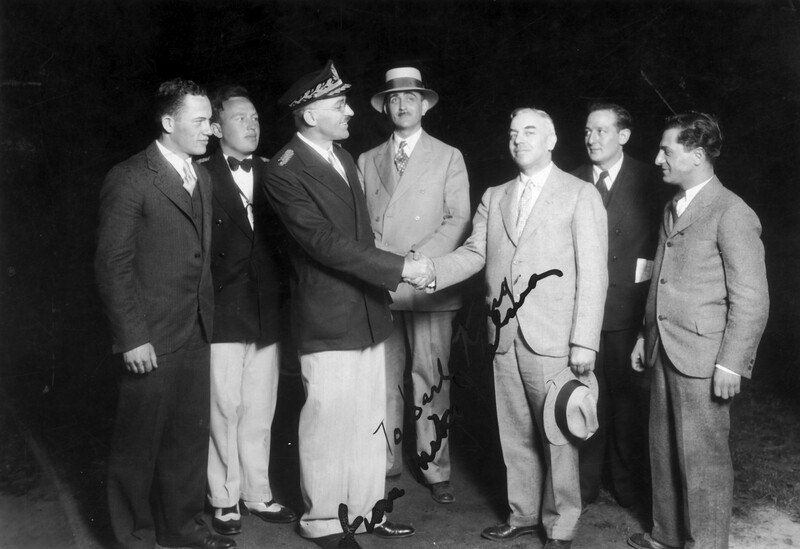 In the picture from the left: Curtis Crippen, manager of the Minnesota University Band of 1929; David Westlund, vice president of the Minnesota University Band; Michael M. Jalma; Karl L. King; A. Austin Harding, bandmaster of the University of Illinois Band; Meyer L. Lefkowitz, manager of the Minnesota University band of 1930 and manager of the Minneapolis Municipal Park band of 1929; Michael Fadell, KSTP publicity director and manager of the Minnesota University Band of 1928. This band is a professional A.F.M. organization, supported by the city of Fort Dodge through the Iowa Band law and plays both winter and summer concerts in Fort Dodge with the exception of a few weeks each fall and when the band makes a tour of fairs and expositions through the middle west. Under the direction of Mr. King an the able management of Walter L. Engelbart the organization has become wone of the best known and most active bands in the country and is an excellent example of what can be accomplished by a good band with the assistance of municipal support under a good band law.